I know that this seems like a topic that is in everyone’s blog post but that because it is in my own personal opinion one of the most important concepts to be teaching. This isn’t because of being the coolest new buzz word to get everyone’s attention but because it actually makes our students smarter. Now I really don’t have any research to back me up here but from what I have seen in K-6 it has made my students smarter. Not book smart but thinking smarts. Coding didn’t teach my kids to memorize facts or to follow procedures but to think about what they are doing and why. Sure many of them often followed other people’s ideas but the thinking that went into understanding code was tremendous. 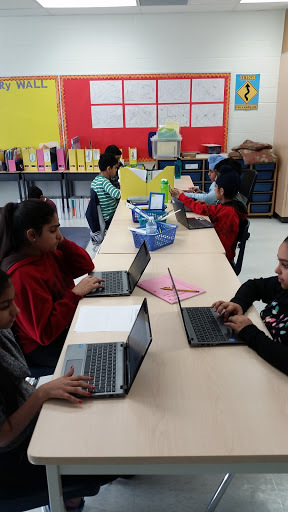 Coding in my classroom is not just about computer science. I do not believe that in my role am I a)qualified to teach the skills and b) is the place but what it is, is part of my everyday teaching. For me coding is a tool, a vehicle for me to teach with. I treat it like I do any piece of technology or paper. It gives students a platform for learning. But it is the teacher that brings out that learning. I will be the first to tell you I only know the basics of code. But it is amazing to see kids understand and practise knowledge concepts through the act of coding. 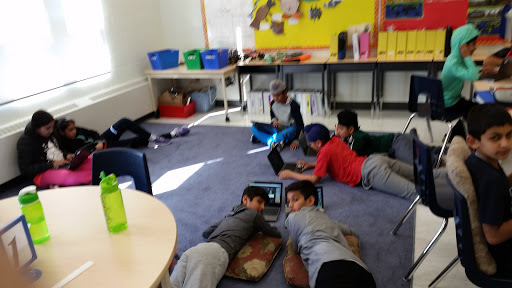 Coding makes my students think about what is going on. 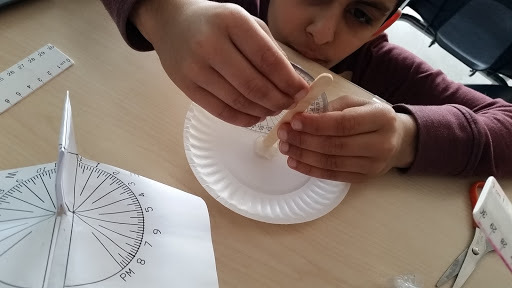 It makes them understand the algorithms that we teach and learn in class and it gives a place to solidly knowledge that we normally solidify with a test or some sort of worksheet. Coding makes kids think and makes them creators and innovators. It teaches them to problem solve, to think and isn’t that what we want for them? So the questions then becomes how do I start? Simple answer like you would another lesson. Have a big idea that you want to teach with, plan possible outcomes and find ways to modify for various students. Now think of a way to insert coding. You see it is not coding that makes it a great lesson but the planning that you do before hand. You cannot go into a lesson a just say hey let’s code, you still have to plan. Measuring the distance around my hand in pixels: this grade 2 lesson had kids have their pixie move around their hand and count the pixels of their movement. We then compared the distance of our hand to fingers or the width of our thumb to that of our pinkie. Are two great iPad apps that have many great practical knowledge built in. Counting, rotation, spatial sense, Cartesian planes, etc. Coding has endless possibilities it is all up to your planning and own innovation. Remember it is not the tool that teaches but the teachers. Coding is a tool but you still need a good plan to teach. Author MrSoClassroomPosted on January 25, 2016 May 7, 2016 Categories coding, teaching, teaching mathLeave a comment on To Code or not to Code? What does it mean to innovate? Google has opened their Google Innovator Program (formally their Google Teacher Program) and this year they want applicants to think about an Innovation for education. This prompt got me thinking, What does it mean to Innovate? There are so many innovative people that I have met over my teaching career, from looking at what I admire in them here is what I think about innovation. An innovator is someone who thinks outside of the box. They are always willing to push the boundaries of education in order to better the profession. An innovator is able to make connections to many varying subject matter. An innovator is energetic, enthusiastic and has a zest for learning. They themselves are as much the learner as the innovator. An innovator is someone who continues to questions and is never satisfied with one answer. They don’t just do things because its always been done. An innovator doesn’t have to be the loudest person in the room but is someone who let’s their voice be heard. They are leaders and teachers. However, as I am asked to think of an Innovation project I do get stuck. Is my idea good enough? Is it innovative enough? Has it been done before? However, this is the frame of mind that blocks innovation. What I do know though is that not everyone is an innovator but that everyone can be. It takes a special drive to be one but a personality that is in us all. 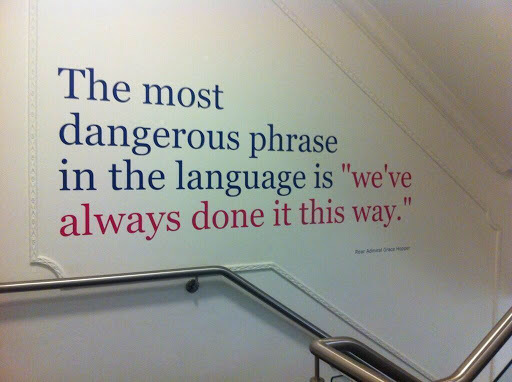 We all can be an innovator, just have to remember that the most dangerous phrase is that it has always been done this way. What are you doing to be an innovator? How will you change education? Love to hear your thoughts. Author MrSoClassroomPosted on January 8, 2016 May 7, 2016 Categories UncategorizedLeave a comment on What does it mean to innovate? So as many of you know I have started a new grade this year, grade 6. It has been fun but also very tiring. My vision for grade 6 was to have a totally inquiry run program. I wanted my students to be engaged in asking questions and being part of the design of the curriculum. I was tired of the traditional classroom. Now I am far from being a traditional teacher but was still finding that I have held on to many traditional ways. Even though my practice had a lot of student voice there was room for more. I was tired of assessments not being read or student choice still being directed by me. I started the year by changing the layout of my class. 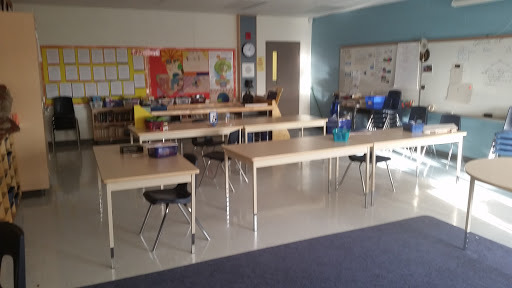 I got rid of traditional desks and opted for tables. I wanted the space to be creative and flow. To give my students the options depending on their needs. Now in no way is this the best situation but it has really opened up the traditional flow of a classroom. I also started to do a more circular curriculum. Meaning that I teach a little of the curriculum at a time and keep circling back. It has allowed me to teach all of the curriculum in one term and making broader connections between strands and subjects. Students see the bigger picture and it has allowed them to make deeper connections. I wanted to teach predominately through Inquiry and Project based learning. Now this wasn’t a stretch for me as I was doing this already but I really wanted to take this further. I wanted my students to really have direction and choice of where the projects would lead them. Now there is still the curriculum but I have let my students be a part of where they want to take the learning. This is done by setting the learning goals as the big ideas of the curriculum and then letting the students chose the avenue to present their learning. We then have a sharing session so that all of the students can hear what the others have learned. I also have started many new things this year to incorporate as part of my vision. In other blog posts I have discussed Collaborative Problem Solving approach from Dr.Greene. 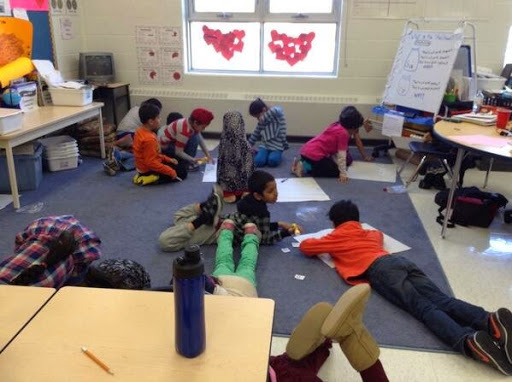 I decided that part of making my students a part of the classroom was to have them talk as a classroom. We have started community circles to share our problems and frustrations. We then discuss how deal with them. I have noticed a real improvement in their behaviour and how they have matured. At the beginning of the year problems were very juvenile but they now are discussing how to make the classroom better versus who said what in the hall way. I have also decided to throw out grades. Now this may seem weird but I have not given a letter grade at all to any of my students all year. Instead I provide feedback that is combined with their own feedback. We talk about what curriculum they have met and how they have met it. This allows them to see what they still have to accomplish and how. At the end we do discuss a final mark for their reports but this is often a collaborative discussion. Again I have seen a dramatic improvement with their work. Probably the biggest strides in learning I have ever seen. Students are more reflective and actual read their comments and compare it to the curriculum. My new goal is to have them write parts if not all of their reports. So far all is going to plan. There has been some hiccups along the way but for the most part it has been really amazing. I have seen so much gains both academically and socially. My students have really matured and a lot faster than I have ever see any of the kids in the past. What has been your vision this year? How is your year going? Any advice? Love to hear your comments.